The BMW X5 was Europe's most popular premium large SUV last year despite a 6.9% sales decline. 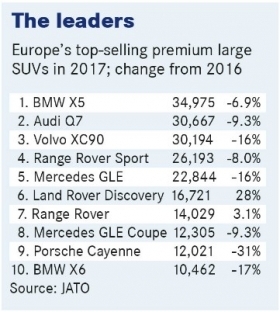 A two-year slump in the demand for premium large SUVs in Europe is expected to end in 2019 as BMW and Audi launch new flagships and Mercedes-Benz replaces key models. Sales in the segment fell 8.8 percent last year to 246,573 units, according to data from market researcher JATO Dynamics. Only two models, the Land Rover Discovery and Range Rover, posted growth among SUVs in the sector's top 10. The segment continued to be led by the BMW X5, followed by the Audi Q7 and the Volvo XC90. Land Rover was the top-selling automaker in the segment with a combined volume of 57,125 units, led by three models in the top 10: the Range Rover Sport, Range Rover and Land Rover Discovery. BMW was second overall with a combined 45,437 sales of its X5 and X6. Mercedes was a close third with 45,269 sales of its multiple model families, according to JATO figures. Despite the arrival of new models this year, the sector's 2018 volume will fall again before rising by 8 percent in 2019 and pushing past 300,000 units in 2021, analyst firm LMC Automotive predicts. One of the new models due this year is Audi's Q8 flagship SUV. The Q8 will give Audi a sportier competitor in the large SUV sector alongside its Q7. Mercedes is counting on a small boost from the arrival of its new-generation G class in the sector but LMC expects the bigger lift to come next year when the automaker debuts a new version of its top-selling GLE. BMW will expand its presence in the segment with the forthcoming debut of the X7, a seven-seat flagship SUV that will start rolling off the assembly line at the automaker's U.S. plant at the end of this year. 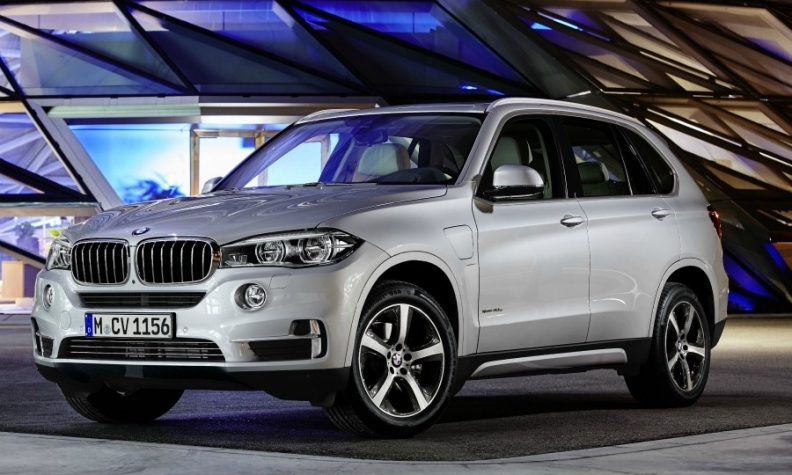 The arrival of the new-generation X5 in 2019 will further boost BMW's volume in the segment, LMC forecasts. 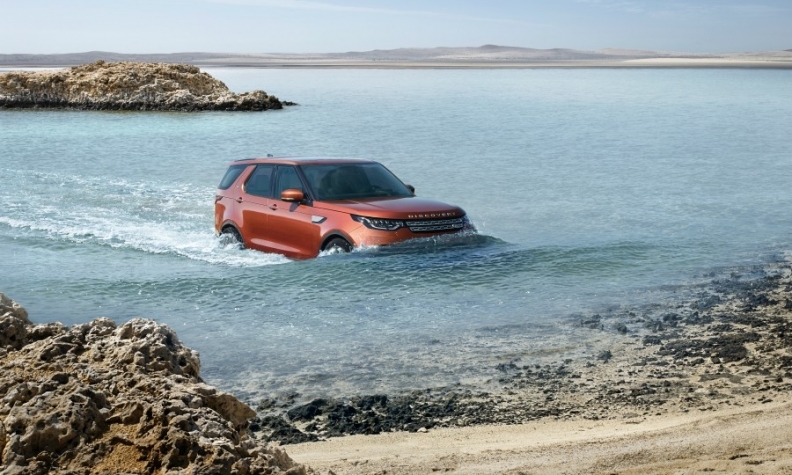 Land Rover increased European sales of the Discovery by 28%, pushing the model to No. 6 in the premium large SUV sector from No. 9 in 2016. Land Rover will continue to explore buyers' appetites for differing body styles by launching a limited-edition two-door coupe version of the Range Rover, which will be shown at the Geneva auto show this month. Production of the car will end after 999 units, the UK firm said. Land Rover is also looking for models above the Range Rover to compete in the growing luxury end of the market, Design Director Gerry McGovern told Automotive News Europe last year. "We have the pedigree and authenticity in that particular sector of the market, so why wouldn't we do it?" he said. One area where Land Rover has been slow to catch its German premium rivals is in electrification, but it filled that gap last year with the launch of the Range Rover and Range Rover Sport P400e plug-in hybrids. The models use 2.0-liter turbocharged gasoline engines mated to a 13.1 kilowatt hour battery that the automaker says can provide an electric-only range of up to 50 km (30 miles). Diesel sales in the segment fell 10 percent resulting in a 73 percent share, according to JATO. Gasoline sales rose slightly to take a 10 percent share, but the big winners were electrified vehicles. Sales of hybrids, plug-in hybrids and full-electric models, led by the Tesla Model X, grew 10 percent to 40,564. That resulted in a 16 percent share, up from 14 percent last year. Plug-in hybrids accounted for a little more than 20,000 of those sales last year, slightly down on the year before. The leader was Volvo, whose plug-in hybrid version of the XC90 accounted for 25 percent of the car's total sales in western Europe, according to Swedish-based analyst AID. Lexus continues to be the only automaker offering a gasoline-electric hybrid in the segment. This specialization, however, hasn't helped it capitalize on Europe's shift away from diesels as sales of the RX slipped 12 percent to 7,691 last year. 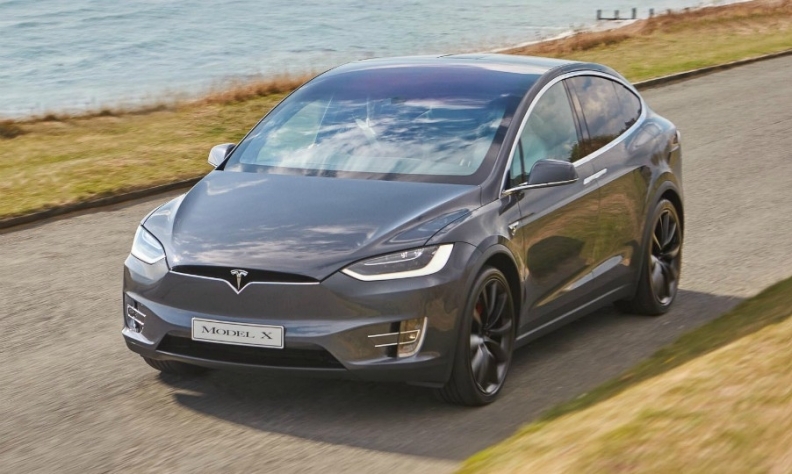 Tesla sold more than 12,000 units of the Model X in Europe last year. That was more than the BMX X6. One reason for the segment's sluggish growth is that sales are dominated by two countries: the UK and Germany. "They are both very mature markets that are already at high levels by historical standards," said David Oakley, EMEA analyst for LMC. "Both of them are forecast to be relatively flat overall." Germany recorded 66,240 premium large SUV sales last year, with the UK just behind at 64,900. Meanwhile third-ranked Italy accounted for just 16,110, with France at No. 4 with 14,118 sales. The leader by market share last year was Norway at 6.4 percent. Latvia was No. 2 at 4.9 percent. Luxembourg and Switzerland were fourth and fifth with 3.5 percent and 3.3 percent, respectively. JATO figures show that the average sales price for this segment in Germany was 80,126 euros. Last year Europe was the third-biggest region for premium large SUV sales after the U.S. (592,800) and China (321,400). Demand for the models in China grew 29 percent last year.